An Expert Inspection, or PDI, Is A Must-Do Before Purchasing A Used RV. After a decision has been made to purchase a used RV, experts in the RV industry highly recommend having the motorhome thoroughly inspected before it is purchased. Pre-purchase RV inspections are otherwise known as a PDI or “Pre Delivery Inspection”. PDI is a term motorhome manufacturers use for the final operational and quality inspection given to each RV after it rolls off the production line and before it is delivered to a customer or an RV Dealer. These inspections are critical to the manufacturer to maintain reliability, safety, quality and a good reputation within the RV industry and for the same reason, many motorhome dealers also perform PDI’s on their RVs before delivery to their customers. 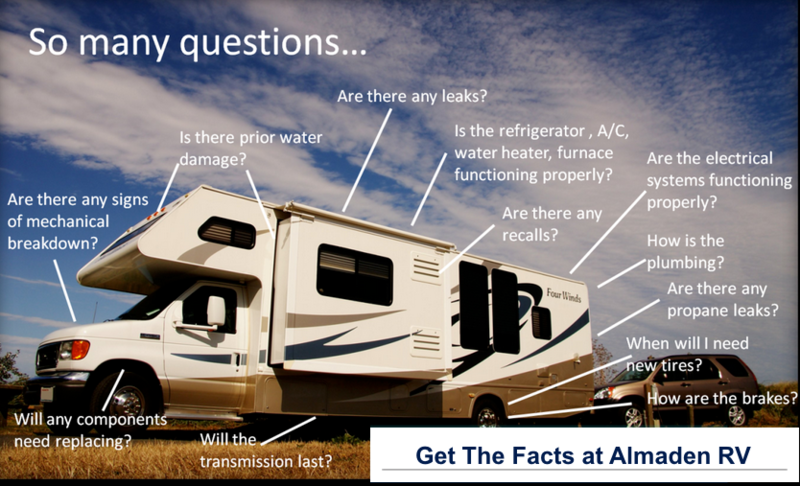 It is common for a reputable RV dealer to give the new owner a “walk through” of operations covering items such as appliances, slide outs, vents and windows, electronics, entertainment system, plumbing, awnings, generator, holding tanks, A/C and Furnace, the engine, transmission, brakes and more. Almaden RV in San Jose California is one of the nations leaders in RV service and repair. It’s likely that if you have a problem or question about your motorhome, Almaden RV will know about it and will have the best and most cost effective solution. PDI’s for an RV is not cheap because they are very time consuming, but a PDI is well worth the investment. Most often buyers will return to the seller with the results of the inspection and are able to negotiate a reduction in the purchase price for the motorhome. In fact, for most people the cost of the PDI becomes insignificant either from a obtaining a better price for the RV purchase or as peace of mind that they didn’t get ripped off and that there will be no surprises down the road on their next trip. Almaden RV’s factory trained expert technicians will give your prospective RV an 80 point inspection to reveal any issues and good news there may be for your future motorhome. Prices range from $375 for small motorhomes up to $750 for very large RVs such as diesel pushers. Almaden RV will also prioritize any concerns from critical to needing attention at a later time. Give Almaden RV a call today to get more information and to schedule a PDI. Get the facts so you can get the best price and travel down the road with the peace of mind you deserve for you, your family and friends.